The Scorpion – It was once believed that scorpions killed themselves when surrounded by a ring of fire. This is not actually true, but humans do indeed kill themselves when surrounded by what they feel are insurmountable obstacles. This is the lowest form of transformation associated with Scorpio and in traditional Hermeticism it was considered a “bad” symbol. The Snake – The snake, or serpent, was thought to contain both “good” and “bad” elements of transformation, and undulated between them. This was the intermediary level of Scorpio’s transformation. The Eagle – This is the “highest” level of transformation associated with Scorpio. It symbolizes leaving behind the earthly realm, and soaring high above in exaltation. Scorpio is a Water sign, and it is not surprising to find Nun means fish, symbolizing life beneath the sea. What is notable is that Mars, a fiery, aggressive planet, rules this path. This gives Scorpio its boiling intensity. 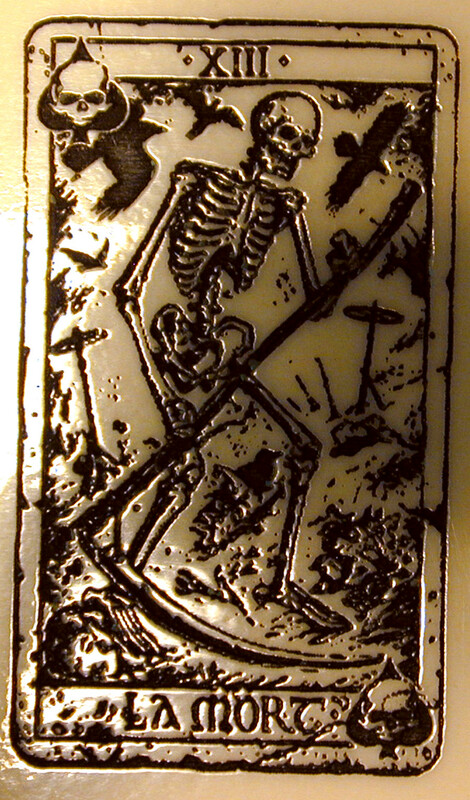 As far as the tarot, almost all versions of the Death card feature some sort Grim Reaper, a skeletal figure with a scythe, cutting down human bodies, trampling them into the ground before him. In one of the earliest surviving tarot decks, the Tarot de Marseille (1713), Trump XIII was numbered, but not labeled, probably out of superstition, the same way some modern buildings “don’t have” a 13th floor. 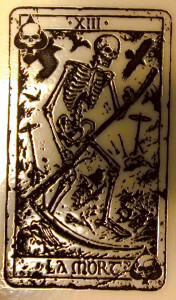 However, the Death card’s bad reputation is due mainly to misunderstanding its true meaning. To this day, it is maligned in movies as an ill-omen, but this is simply not the case. Like other seemingly “destructive” parts of the Tree of Life, any pain found here is purely imagined and caused from holding onto things too tightly with the ego. To the casual observer this still appears to be so, as the scorpion lashes about at unseen enemies giving the impression of stinging itself, but it actually dies from its sensitivity to the heat. However, the scorpion is actually immune to its own poison. The number 13 as an unlucky number goes so far back into antiquity that no one is positive how long it’s been in use or what may have caused the original association.